Gonzalez-Byass UK Ltd., St. Albans, Herts. (made by Timbermill Distillery, Thames Distillers Ltd., Clapham, London), England, UK. (and Jerez, Spain). Imported into the USA by Vin Divino Ltd., Chicago, Illinois - a subsidiary of Gonzalez-Byass. Gonzalez-Byass and The London No.1. The company was established in 1835 by Manuel Maria Gonzalez Angel when be bought a small winery in Jerez, Spain. By 1855 the business had grown and he associated with his Agent in England, Mr. Robert Blake Byass, to create Gonzalez-Byass. Since this time the company has expanded it’s wine/cellars business and produce Sherry and distilled spirits including Brandy, Anisette, Vodka and Gin. The Byass family withdrew from the business in 1998 and 4th & 5th generation Gonzalez descendents still continue to run the business today. If in Spain, why not visit one of their four wineries, they are among the most visited in Europe. This Gin was first released in 2005/6 across the UK and Spain, with a slow but steady exposure in these markets. Following significant growth of 250% since 2011, it is now gaining a limited but developing distribution into other countries worldwide, including the US (New York & Florida) since spring 2014. Corn grain from the English counties of Suffolk and Norfolk are quadruple distilled in a small batch process, in a traditional pot still. The resultant distillate is rested for 3 weeks before being brought down to bottling strength using (we believe) natural spring water from Clerkenwell, London. This pale turquoise blue colored Gin (from the gardenia) is presented in a squat cylindrical clear glass bottle with rounded shoulders. There is a thin strip of black and light blue colored label just below the shoulders of the bottle. $$$$ - $$$$$. Not quite yet available in the USA but can be purchased online from Master of Malt in the UK, just be prepared to add another 40% for shipping. Uses 13 botanicals including: almond (Greece), angelica root (France), bergamot (Italy), cassia bark (China), cinnamon (Ceylon), coriander (Morocco), gardenia, juniper berries (Croatia), lemon peel (Italy), liquorice (Turkey), orange peel (Italy), orris root (Italy) and savory (France). 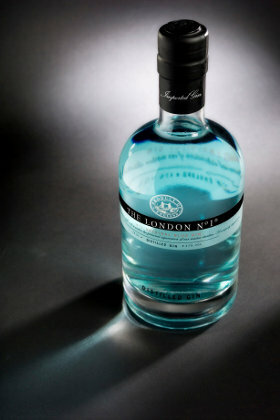 Although called “The London No.1 Gin” (and the fact that it is made in London) it cannot call itself a London Dry Gin. This is because under European Law if any elements are added following the final distillation (and in this case it is coloured blue by maceration with gardenia flowers, plus some bergamot oil is added afterwards) it may not be called a London Dry Gin – thus the play on the name to emphasize it’s London roots. However, the reference may date back to Arthur Wellesley, the first Duke of Wellington, renowned for defeating the French Emperor Napoleon Bonaparte. In the 1770’s, Apsley House, the Duke’s London home was built. Given its prime location on the South East corner of Hyde Park, in the center of London, people began referring to it as No.1 London. On the nose is smoky earl grey tea (bergamot, probably the oil) and pine (juniper) with citric, spicy (coriander) and floral (violet) notes. Many people have identified balsamic style aromas but we must confess this was lost on us. On the palate this medium-bodied creamy spirit is soft in showing gentle but prominent juniper with pleasing amounts of citrus (lemon and orange peel), sweet spicy cinnamon and herbal savory. On the long finish is a sweet (liquorice) peppery spice with a clear acidic and strong astringent ending plus traces of a light herbal note to be found. A brilliant example of a complex and sophisticated, well constructed and expertly balanced Gin. This is a wonderful standard of classic London Dry Gin (although technically it’s not), which has managed to expertly pull off modern updates by using the blue coloration (from the gardenia) and great balanced flavor using light amounts of bergamot. This is the man (or rather Gin) for all seasons due to being liked by many and its compatibility in a wide range of Gin based drinks. Although the blue color may not mix so well with other colored spirits and for some the color may take some getting used to, its worth it). This silky Gin is certainly smooth enough for sipping neat, with a little too much flavor for some, which can be somewhat improved on the rocks with a slice of grapefruit! However a wet Martini or Gin & Tonic are better options - certainly both are above average - with the blue color providing an interesting conversation piece too. We tried this Gin in a variety of mixed drinks and it quickly made its mark, becoming the go to base for Gin cocktails. For us our favorite choice with this Gin is for a G&T as it is quite sublime, and found the choice of garnish significant in its impact. One option is to simply use lime zest, while another is to use a lemon slice with juniper berries and a bay leaf, the best was oddly enough chopped strawberries – with the fruitiness and acidity playing well together. Although not tried by us (yet) it has peaked our interest to think of using Nordic Mist Blue Tonic Water (if you can get some, e.g. if in Spain) to intensify the blue color! Overall the extra expense for this Gin, compared with most, is worth it. The blue color is a novelty (although we believe it does impact upon the flavor of the Gin), but the real reason for seeking and finding this Gin is purely for its quality, taste and versatility – go get a bottle today! 90 Points, Beverage Testing Institute. Silver Medal, International Wine and Spirit Competition, 2014. Gold Medal, Gin Masters, 2013.